Market Rally Fades As Investors Turn Attention From Greece To Spain : The Two-Way Financial markets heaved sighs of relief about Sunday's vote in Greece and then got back to worrying about Europe's financial crisis. 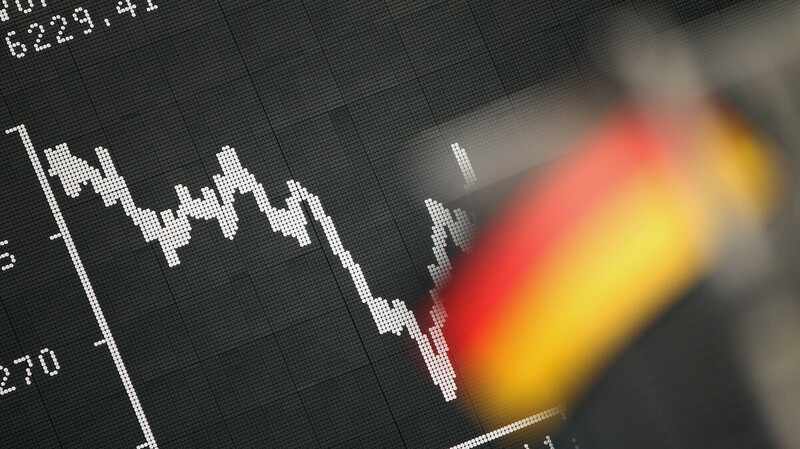 Frankfurt: A German flag hung today in front of a board displaying the DAX stock index. "U.S. Stocks Swing Between Gains, Losses Amid Europe Woes." "We managed to not drive off the cliff in Greece, but we still got flat tires," said Alan Gayle, a senior strategist at RidgeWorth Capital Management in Richmond, Va., which oversees about $47 billion. "There's some heavy lifting yet to go. The challenges in Spain are very much in front of us. There's not a lot of conviction out there." As NPR's Eric Westervelt puts it in a report for our Newscast Desk, "there is deep concern that the euro crisis relief will be temporary as the much larger economies of Spain and Italy remain under pressure due to high borrowing costs, anemic growth and debt." Also weighing on investors' minds: Greece's economic problems certainly haven't been solved just because the conservative New Democracy party, which is known as being "pro-euro" won enough votes to be given the opportunity to form a coalition government. As NPR's John Ydstie said on Morning Edition, while "the prospect of a disorderly exit from the euro by Greece has receded ... there's still a long, uphill road ahead, in terms of trying to stabilize the Greek economy." In Greece, conservative leader Antonis Samaras is poised to launch coalition talks, The Associated Press writes. Meanwhile, NPR's Scott Horsley reports that "President Obama and other world leaders are gathering in Los Cabos, Mexico, hoping to get some assurances at the G-20 summit that European governments are getting control of their financial problems before they become a further drag on the global economy." Nariman Behravesh, chief economist at Global Insight, tells NPR Newscast anchor Paul Brown that "European leaders have to act and act very decisively. ... If they don't, this crisis will spin out of control. ... They do need to increase the size of the bailout funds. There's not enough money in there to save both Spain and Italy ... [and] the European Central Bank has to start to buy up Spanish and Italian government bonds to prevent the yields from rising." The Financial Times is live blogging here. It just posted that "investors continue to sell out of European stocks." Meanwhile, The Wall Street Journal's latest story is headlined "Spanish Yields Surge; Greek Relief Wanes." "Another All-Downside-No-Upside Weekend For Europe."